This simple rice is something I can indulge quite often since I know how to make my own lap cheong. DIY lap cheong is so much cheaper and I know there are no hidden ingredients or preservatives. The is a simple meal, steamed lap cheong with rice and some steamed/blanched green vegetable. To add more flavour I added a dollop of ginger spring onion sauce. Cook rice using a rice cooker or on the stove by absorption method. When the rice has nearly absorbed most of the water leaving about 5 - 6mm depth of water on top, place as many lap cheong on the rice. Covered and continue cooking the rice till done and leave to rest for about 15 - 20 minutes. 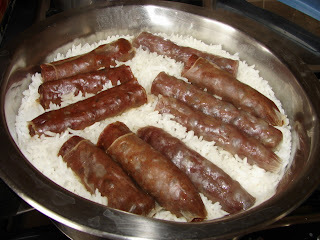 By the time the rice is cooked the lap cheong will be cooked by the steam on the rice and some juice from the lap cheong will penetrate and absorb by the rice give it a nice flavour. Lap cheong can also be cooked by steaming separately if you preferred for about 12 - 15 minutes. I used standard lap cheong and spicy lap cheong, cut into half before cooking. When cooked, thinly sliced diagonally before serving with rice. To go with this I made some yau choi 油菜 using pak choi. Yau choi is Cantonese way saying blanched green vegetable. Boil about 1 - 1.5 cup of water add about 1 - 2 tsp cooking oil when water is boiling add vegetable, stir and cook for about 1 - 2 minutes till tender. Other Chinese green is also great with this like choi sum, kai lan 芥蘭( this will cook a bit loger) or gai choi 芥菜 (fresh mustard green, chunky veg with a mustardy flavour) or broccoli. If you prefer to steam the veg, toss with a little oil before cooking. Oil will make the vegetable greener and glossier, blanched or steamed. Many Chinese restaurants will add some bicarb to the blanching water this will make the vegetable greener for longer, for home cooking this is not necessary. Chopped the ginger and spring onion by hand or using a mini blender to a paste. Mix all the ingredients together, heat in a small saucepan for 1 - 2 minutes till fragrant. This sauce is also very good with Hainanese chicken rice or smear on chargrilled/ roasted meat. Lap cheong is a delicacy for the Foochows. Once a year food in olden days. Now because of old age illnesses most of us eat them again probably four times (each Chinese festival) a year. May be for me it is meant to be!! But I love your write up....thanks. Oh my! 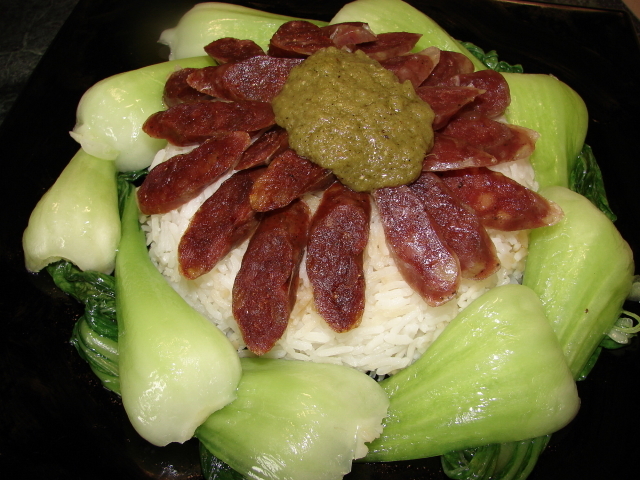 Lap Cheong rice. This really brings back happy childhood eating memories. Alas, I can(t make my own Lap Cheong, so I tend to buy them. In Paris, I can only find the Vietnamese ones which taste quite nice too. thanks for sharing this recipe. It's so easy but I don't often think of making it! Duh! Black soy sauce with lap cheong sounds nice as long as the lap cheong is not too salty. If the rice is really hot, stir in some raw eggs and dark soy it's yummy.